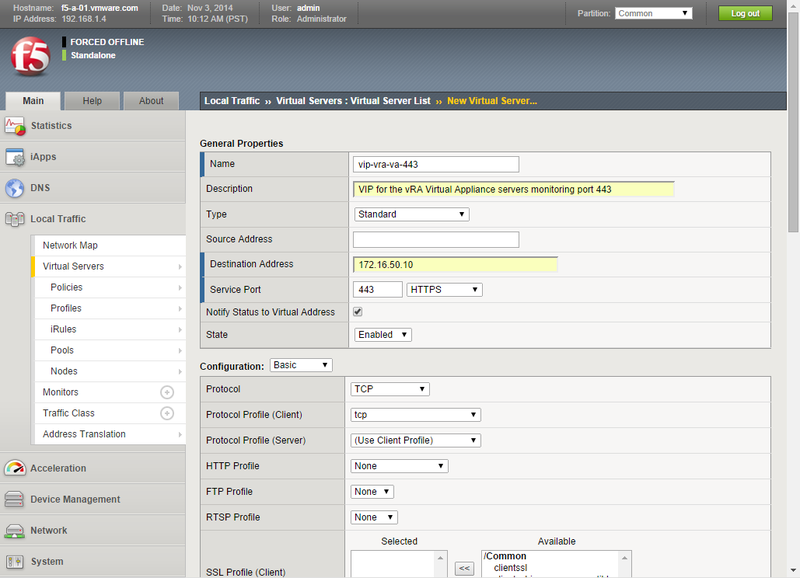 This post will go through the F5 BIG-IP configuration needed so that it can be used as vRealize Automation (vRA) load balancing and high availability solution. 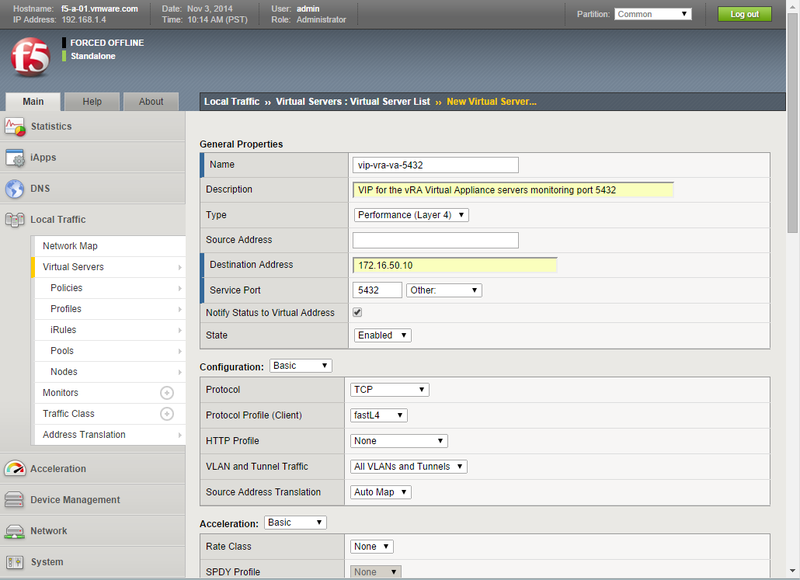 Follow the steps described below to deploy the F5 Big-IP virtual appliance. 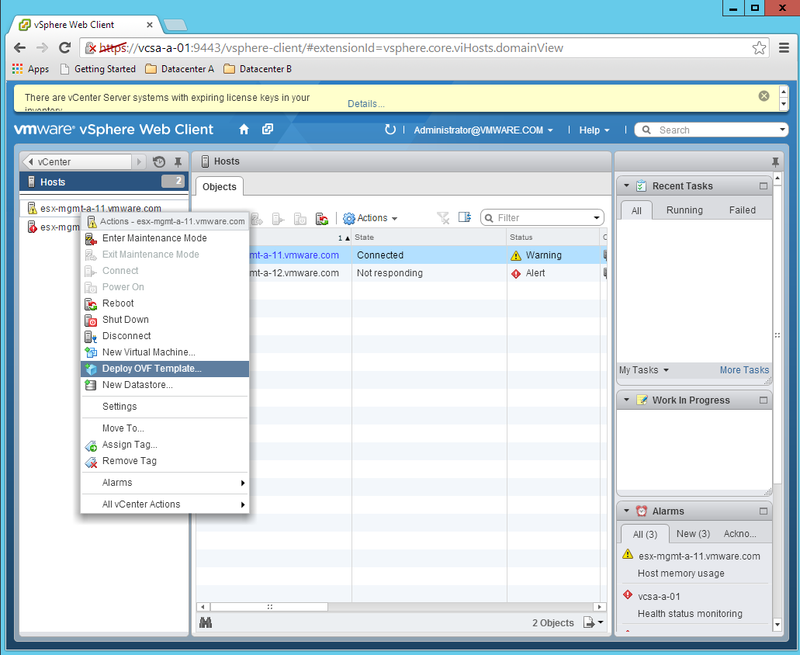 Logon to the vSphere Web Client. In the Inventory List navigate to Hosts and select the host where you want to deploy the appliance. 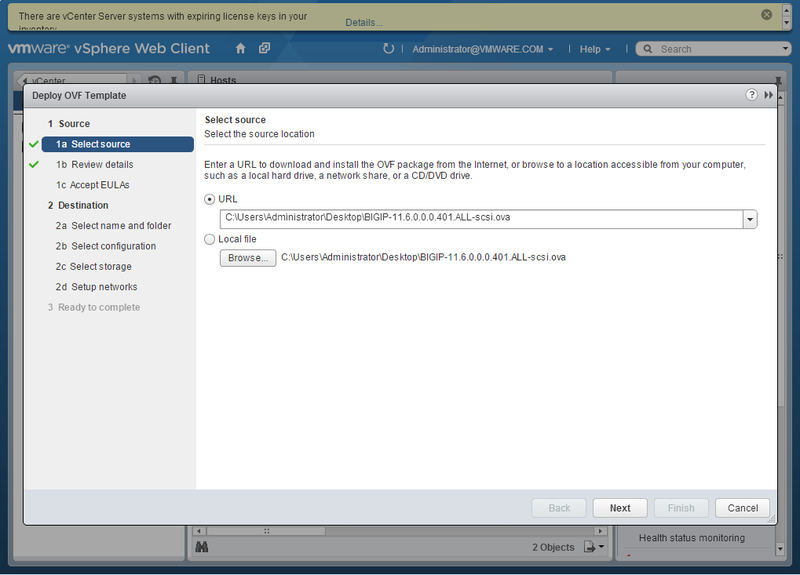 Browse the BIG-IP .ova file and click Next. 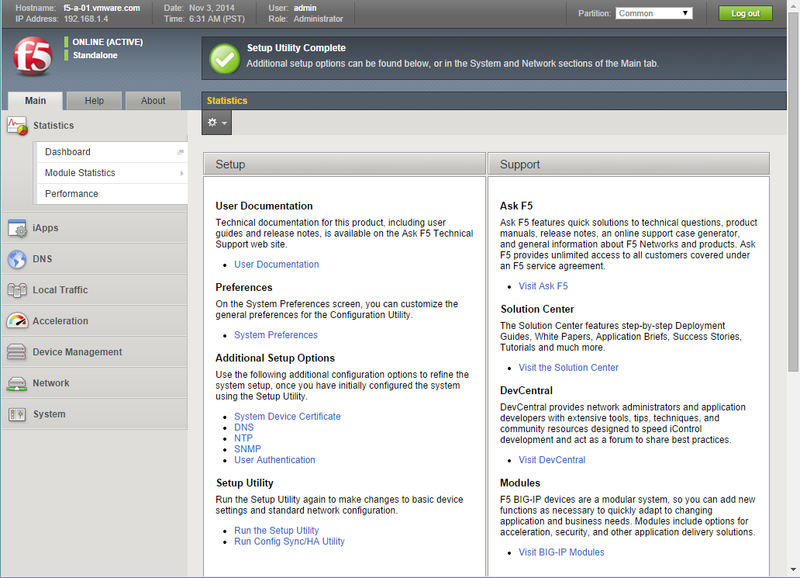 Review the information on the Review details page and click Next. 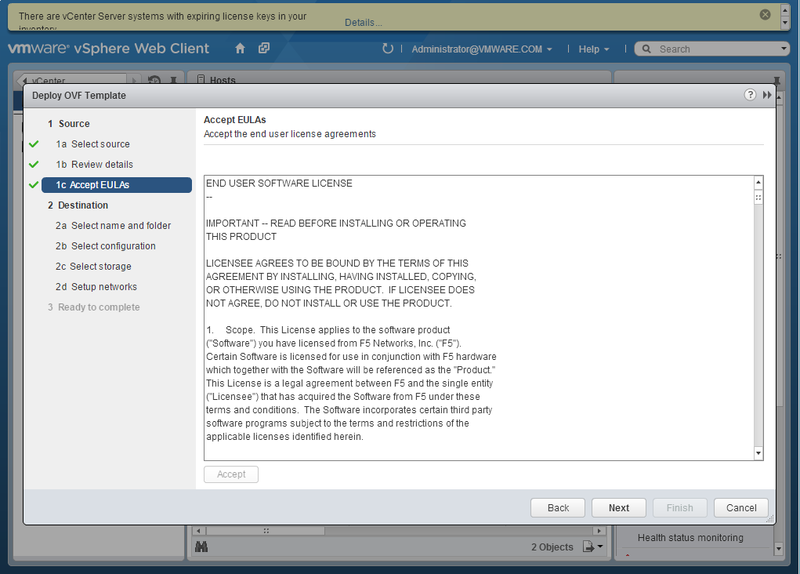 Read the license agreement on the Accept EULAs page and click Accept and Next. 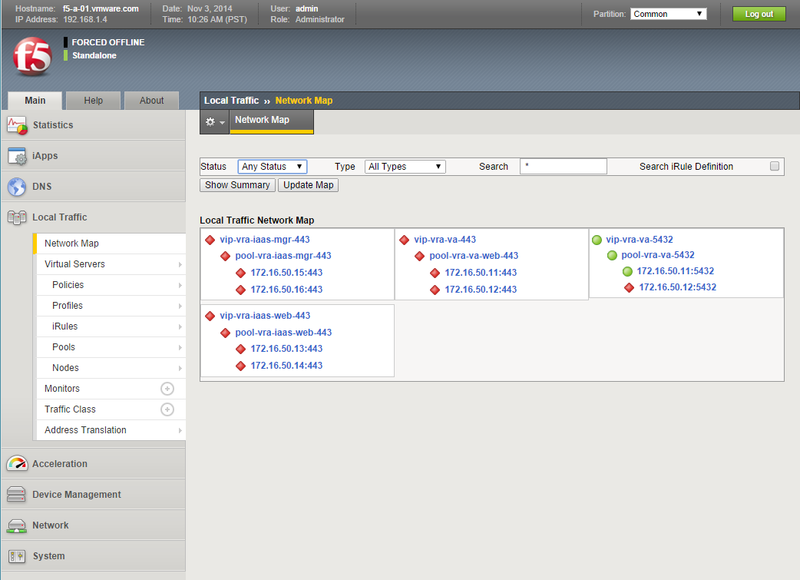 Review the information on the Setup networks page. For the purpose of this document we will not be utilizing the full F5 Network separation and therefore will be using only the Management and Internal interfaces. 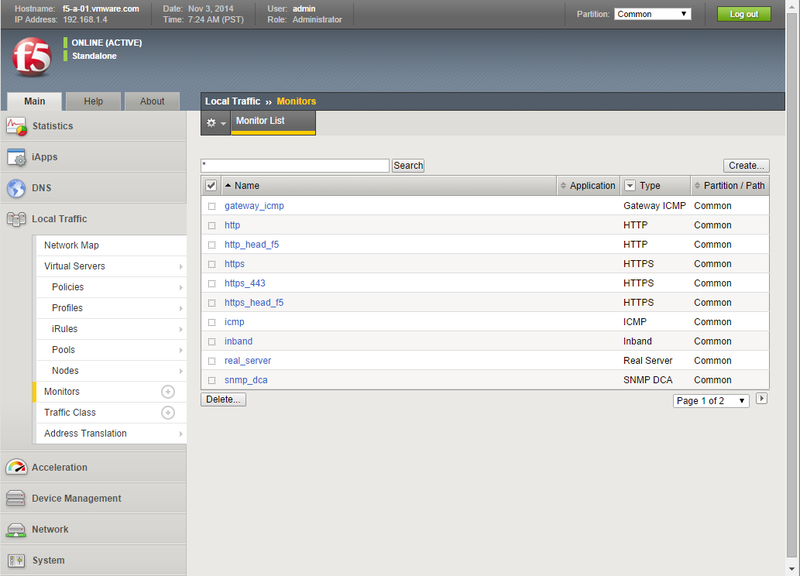 The Management interface will connect the F5 to our management network. 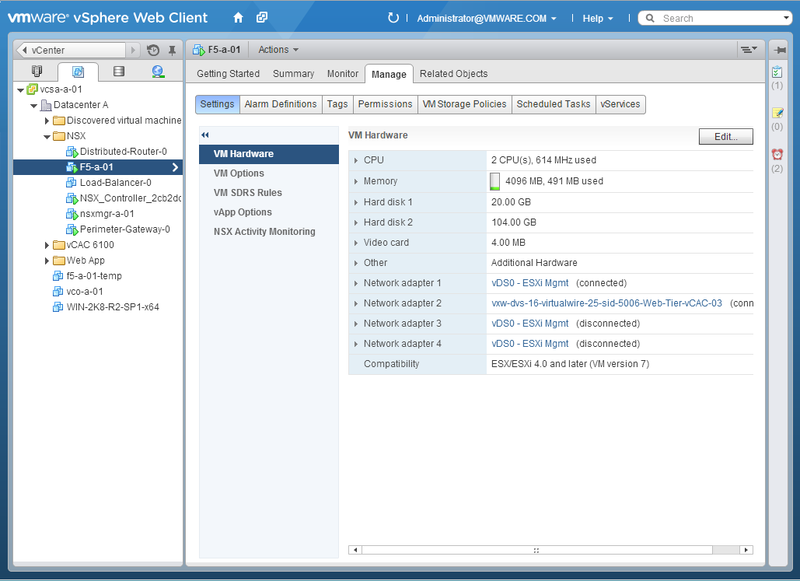 The Internal interface will connect to the network where vRA is going to be deployed. 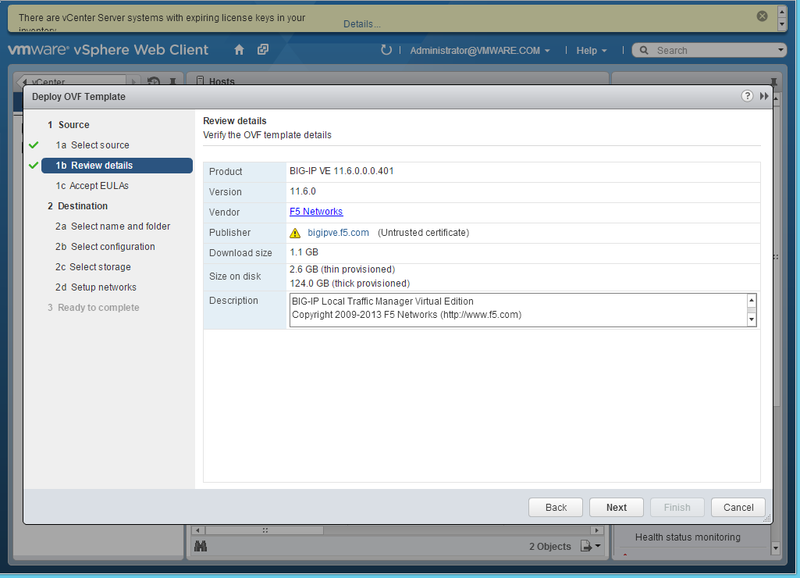 We will not be using the F5 External and HA network interfaces. 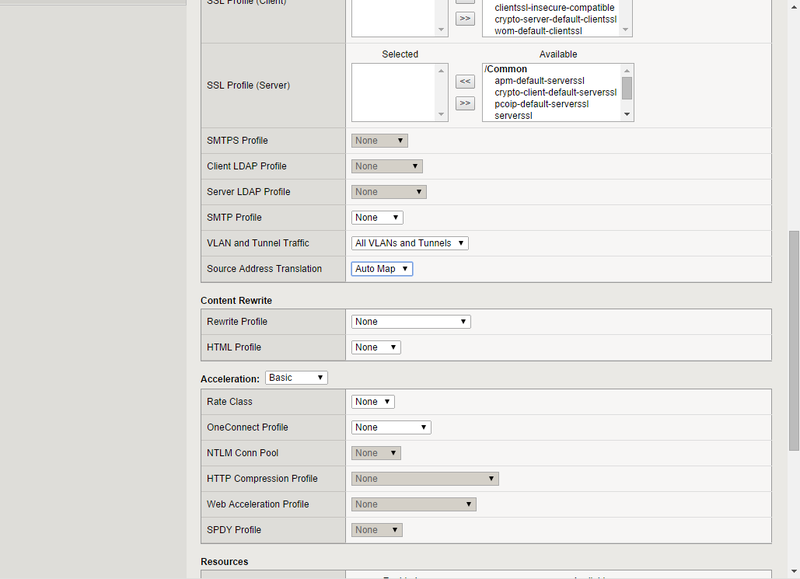 For use outside PoC and test environments please refer to the official F5 documentation on recommendation how to use and configure all available F5 network interfaces according to best practises. 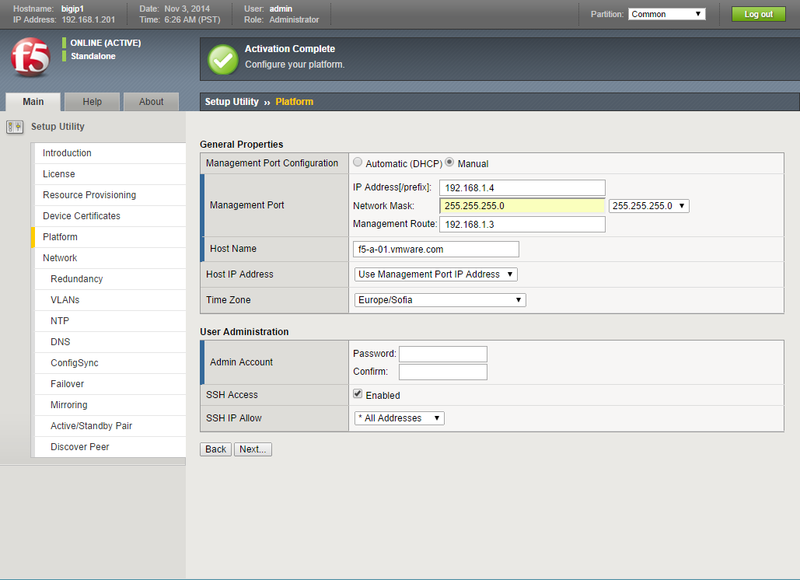 The Management and internal interfaces need to be connected to two separate subnets. 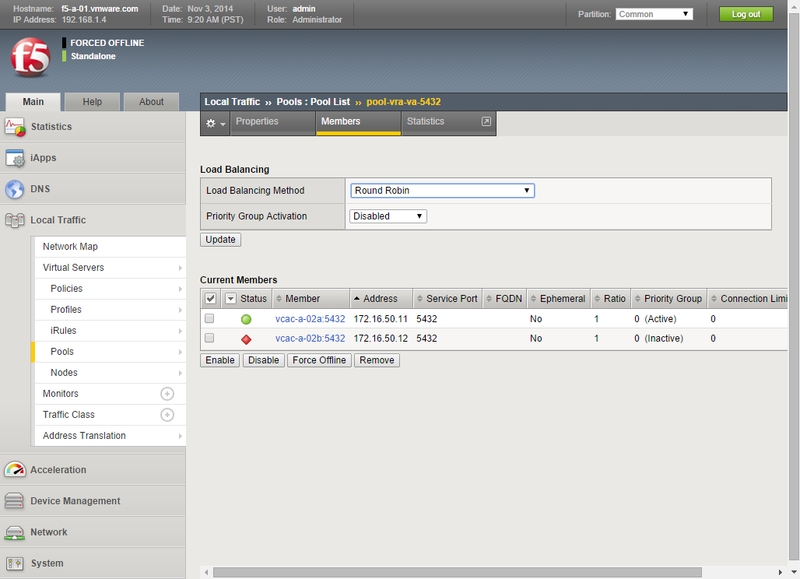 The Management interface cannot be used for load balancing. 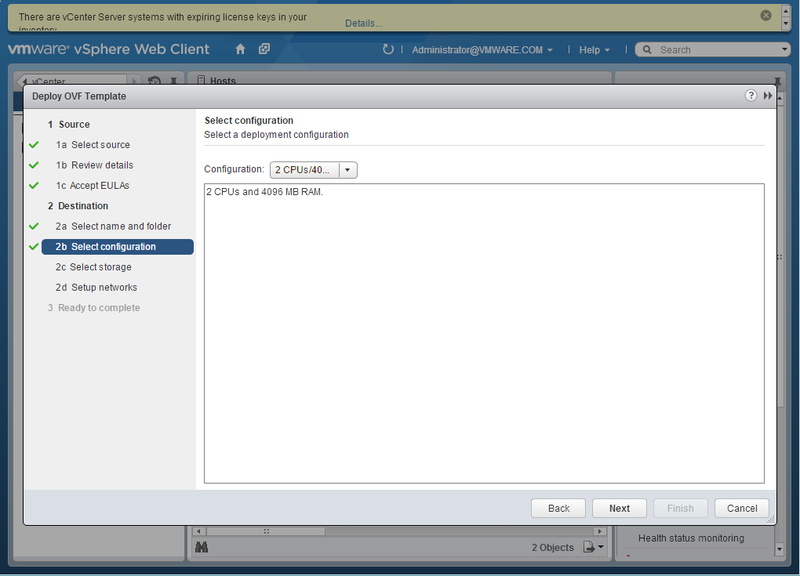 For the purpose of this lab, and due to the nested virtualization we are connecting the Internal Interface an NSX virtual wire where we will be deploying the vRA components. 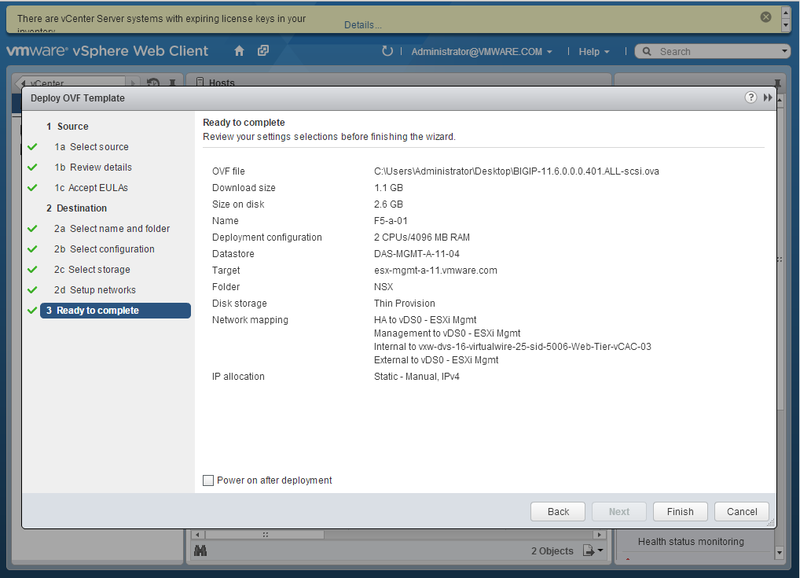 Select the appropriate configuration and click Next. Follow the steps described below to perform initial configure the F5 Big-IP. 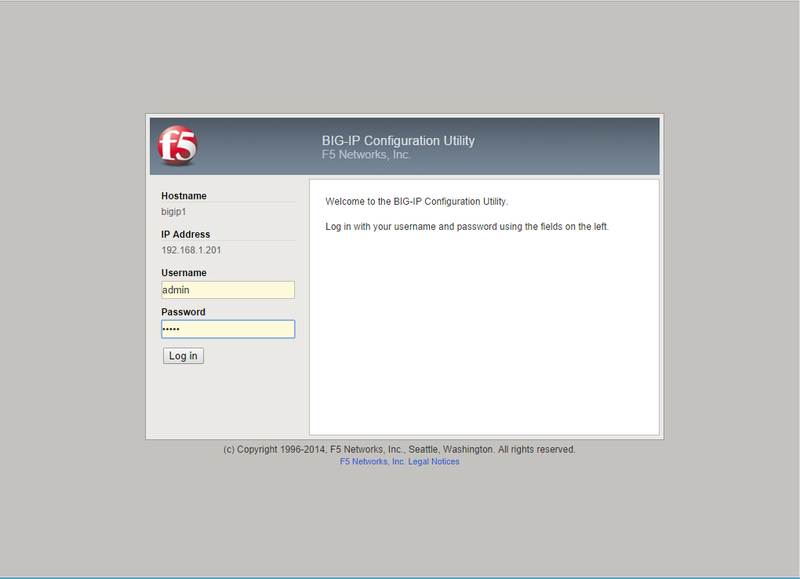 Login to the F5 BIG-IP Configuration Utility. Use default username Admin and password Admin. 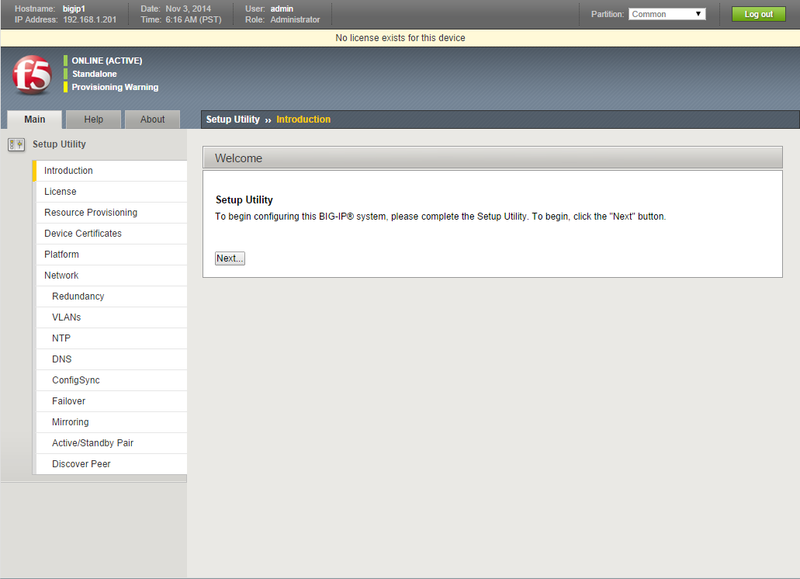 On the Welcome page click Next to start the Setup Utility. 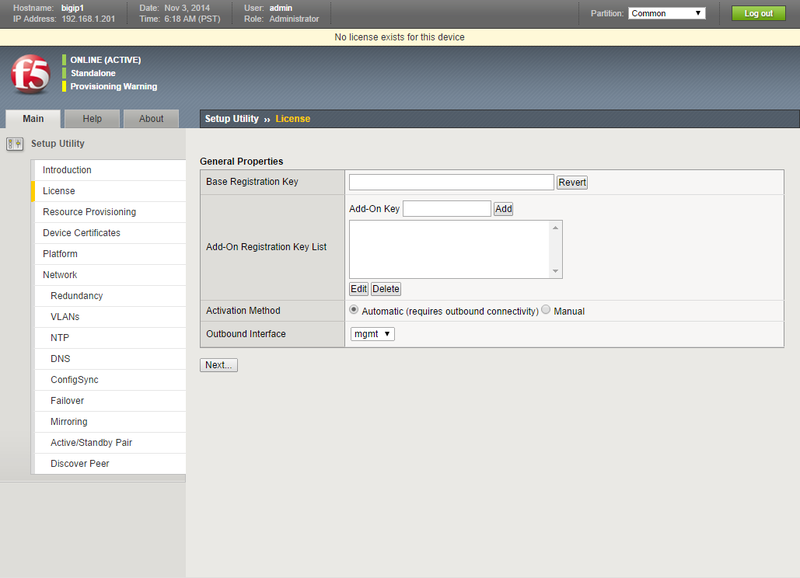 Enter you Base Registration Key and click Next. 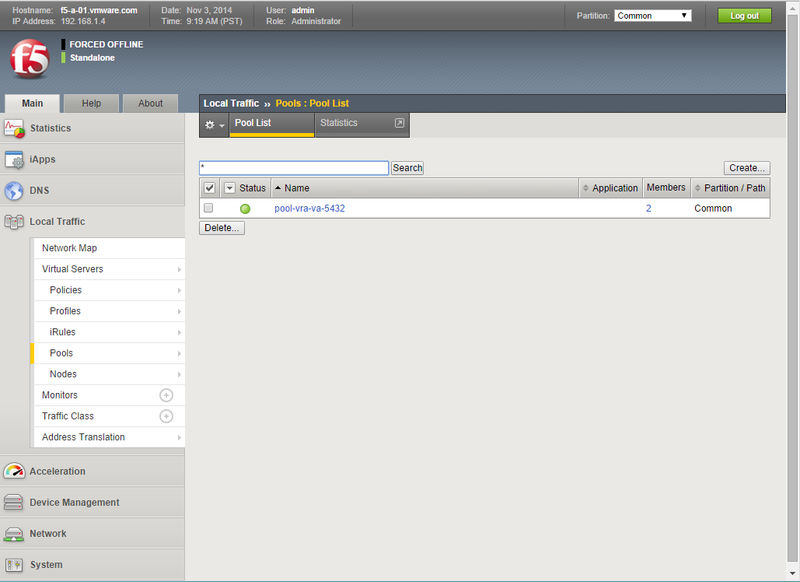 Navigate to the Platform tab and fill in the general networking properties and Time Zone Settings. 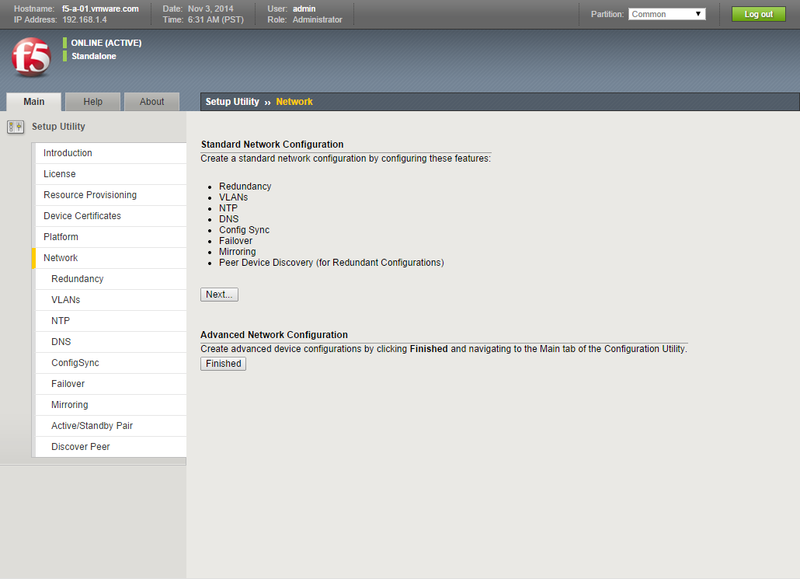 Note: These are the settings for the Management interface you have configured during the F5 BIG-IP Virtual Machine Appliance deployment and correspond to the first NIC of the F5 VM. 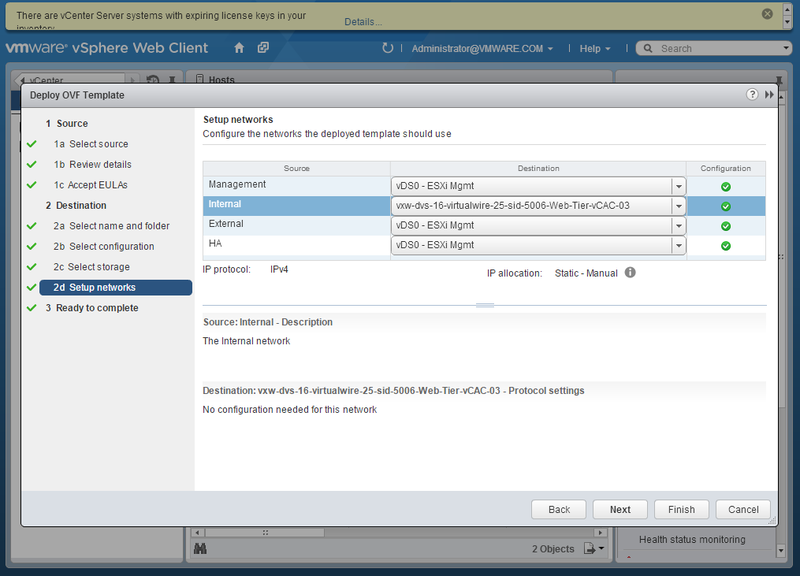 In this example these settings are applied to Network Adapter 1 which is connected to a management network via the “vDS – ESXi Mgmt” vds. The connection to the utility will be temporary reset for the settings to take effect. 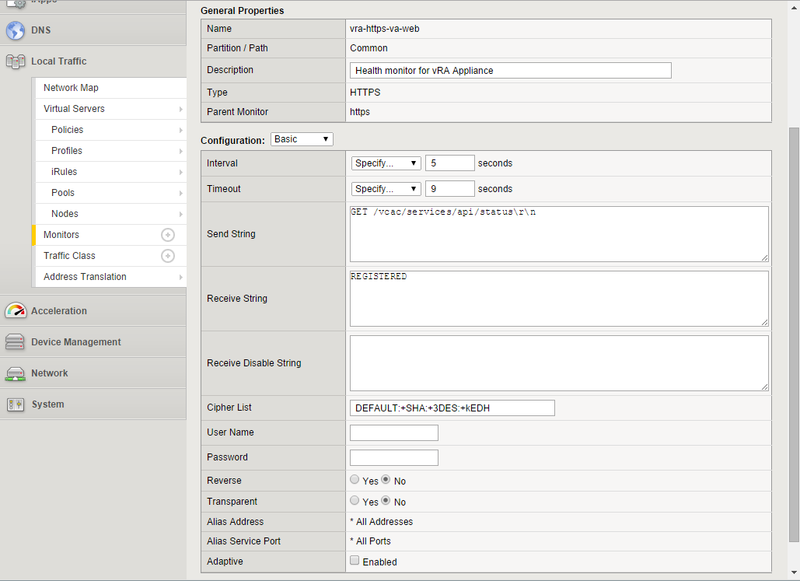 Login again to the BIG-IP Configuration Utility interface. 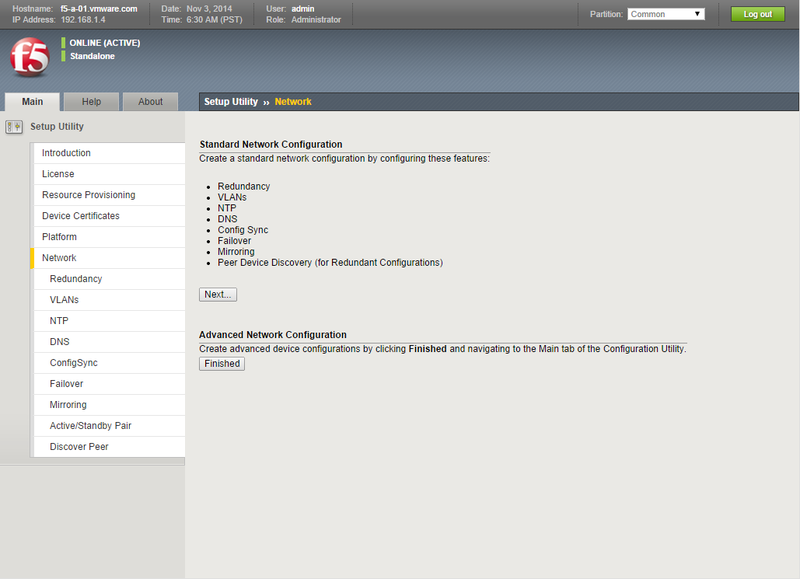 Under the Advanced Network Configuration section click Finished. 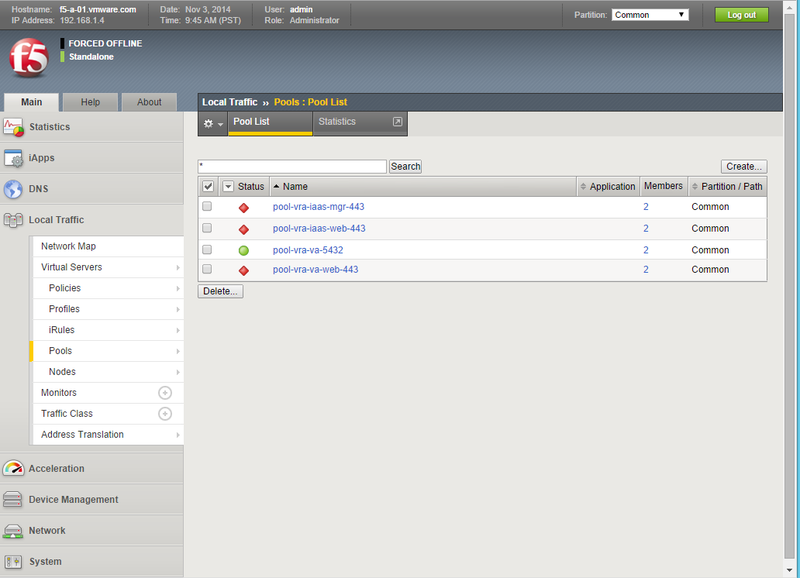 Depending on the License you have entered you will see different tabs and functionalities being enabled. 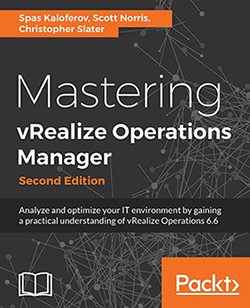 Note: If you do not see any of the configuration options or tabs throughout discussed in this guide, you most likely entered a license that does no’t allow you to use thoese functionalities. If thatis is the case, make sure to you re-activate the product with the correct license and gain access toenable thoese functionalities. 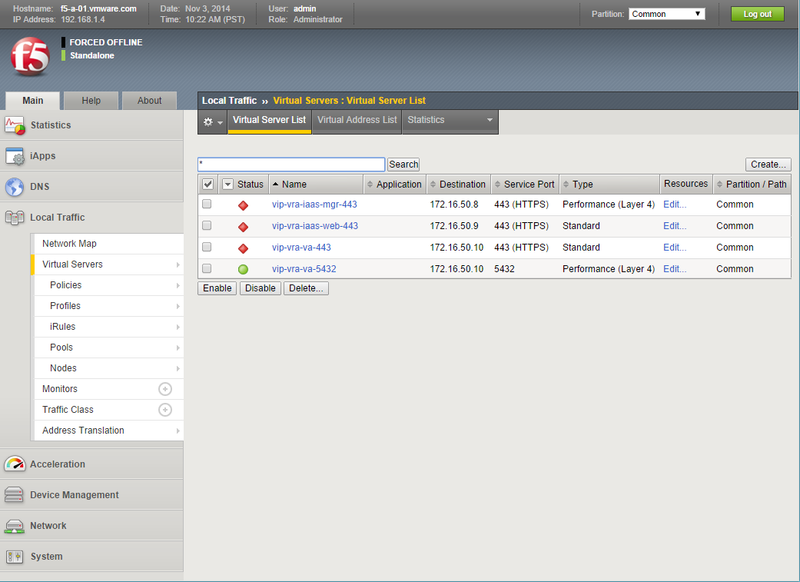 Navigate to the Network tab and then to VLANs. Enter the Name for the VLAN. 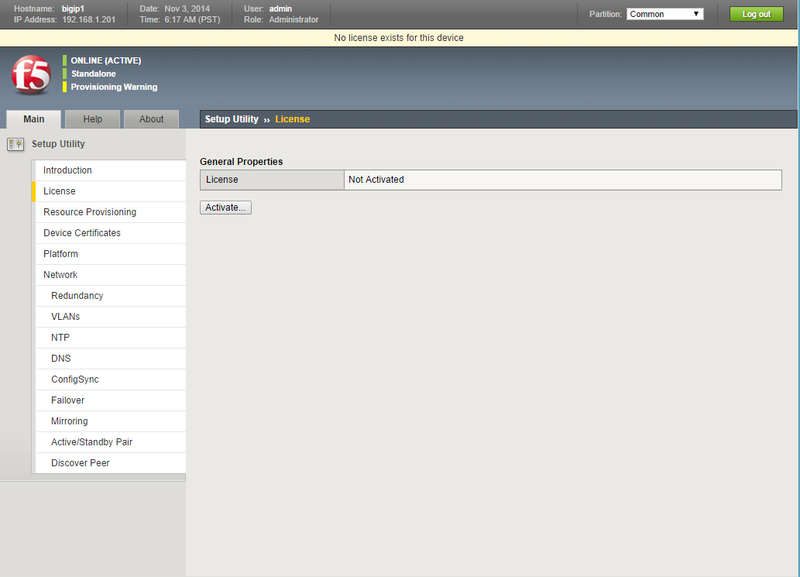 Under Resources make sure Interface 1.1 is selected and tagging is set to Untagged. 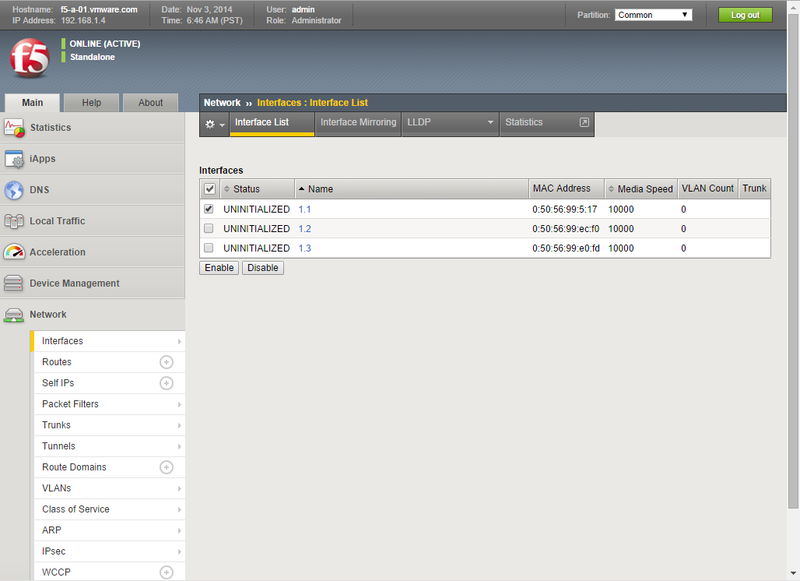 You should see the VLAN being created. 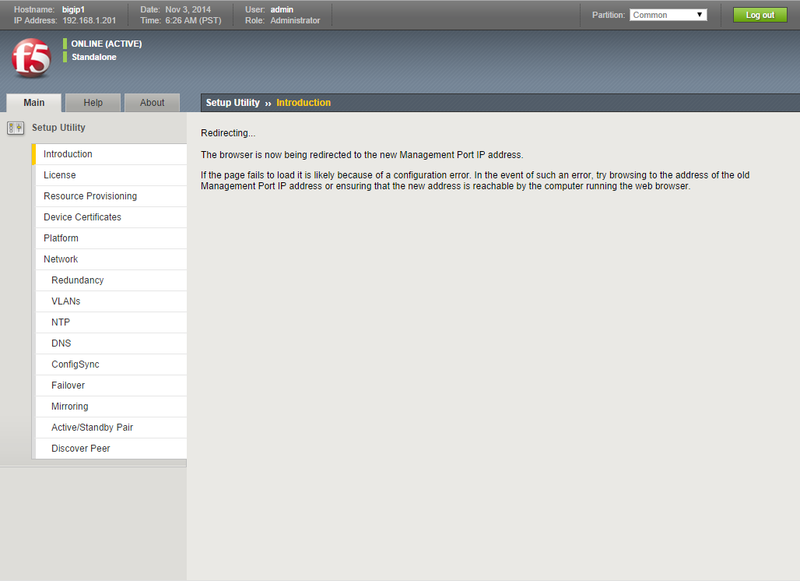 Interface 1.0 is the Management interface that was initialized during the deployment of the OVA and configured earlier in this document. 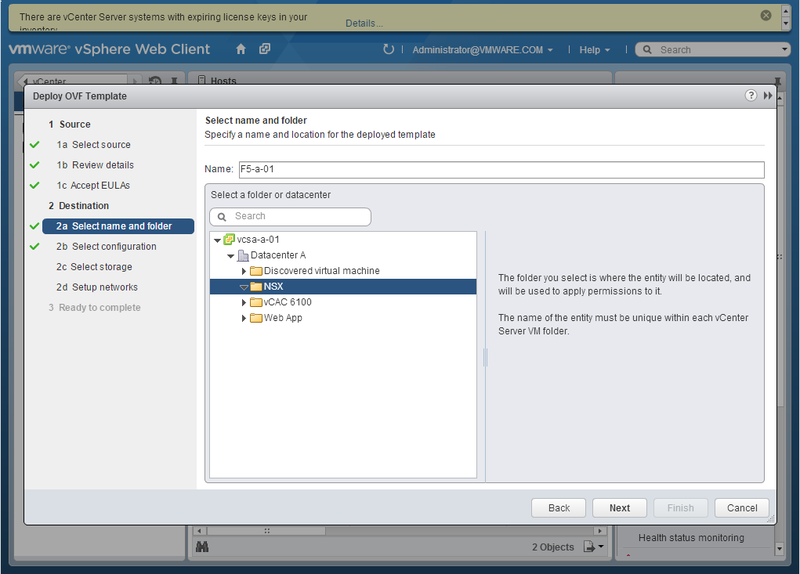 As mentioned earlier for the purpose of this document we will be utilizing only the Internal (Interface 1.1) Interface for vRA load balancing and high availability configuration. The Internal Interface or Interface 1.1 corresponds to Network Adapter 2 of our F5 appliance. We have attached this network adapter to a VDS Switch where our vRA deployment will be done. 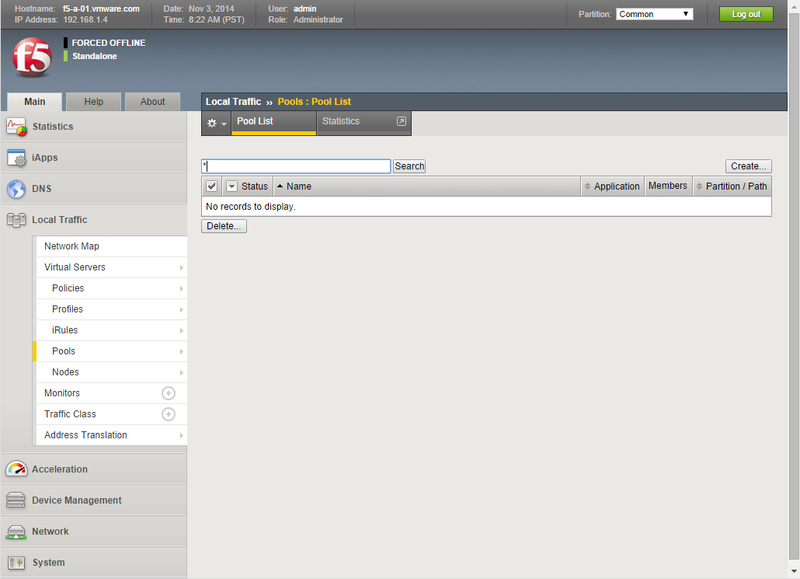 While on the Interfaces page select the Interface with name 1.1 and click Enable. You should see the status of the interface changing from UNINITIALIZED to UP. 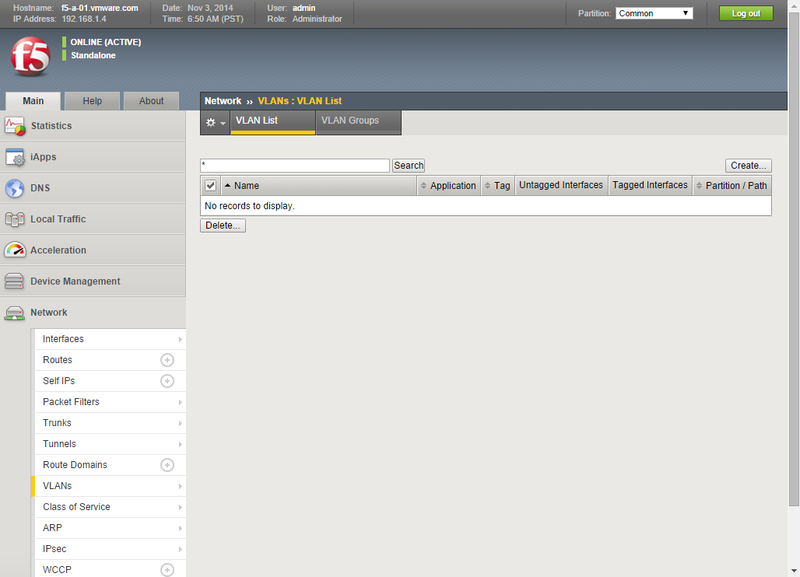 Note: If the Status doesn’t change you have probably misconfigured the VLAN in the previous steps. 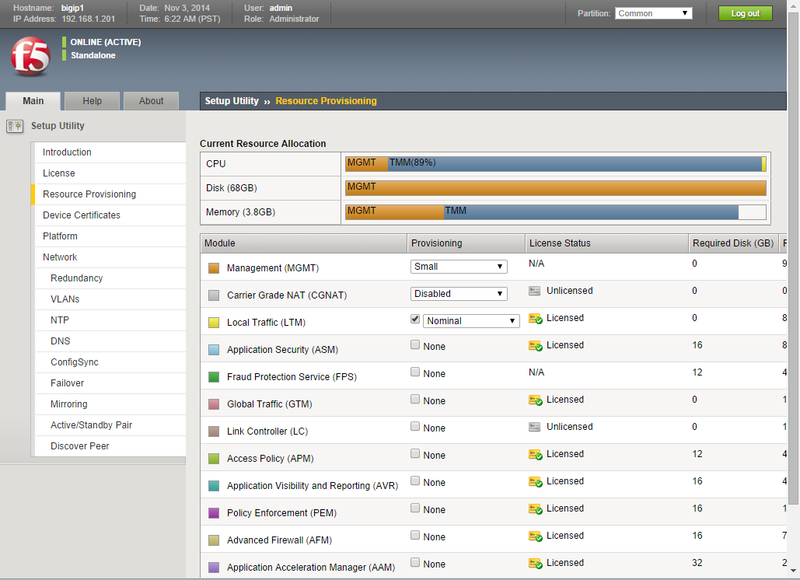 Navigate to the System tab and then to Configuration. 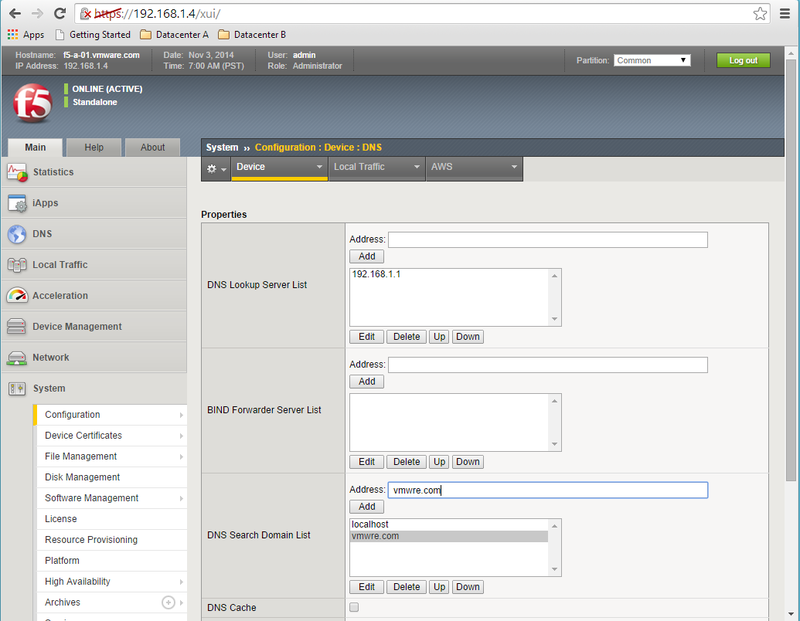 than Device and select DNS. 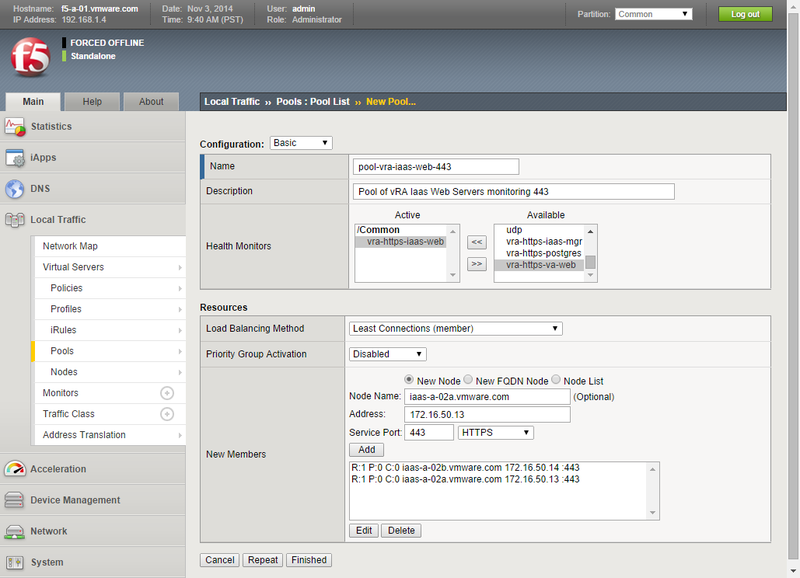 Make sure correct DNS Lookup Server and DNS search Domain have been added. 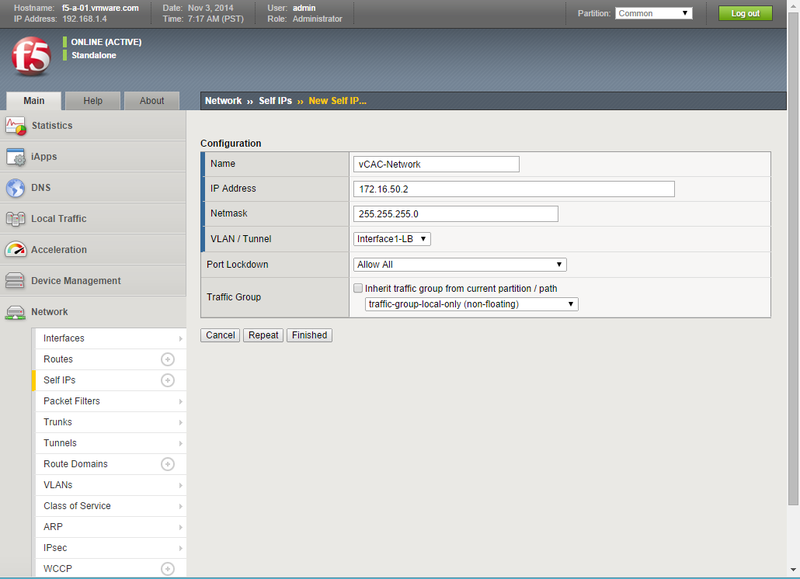 Follow the steps described below to specify self IP addresses and settings for VLAN internal, which is the default VLAN for the internal network. 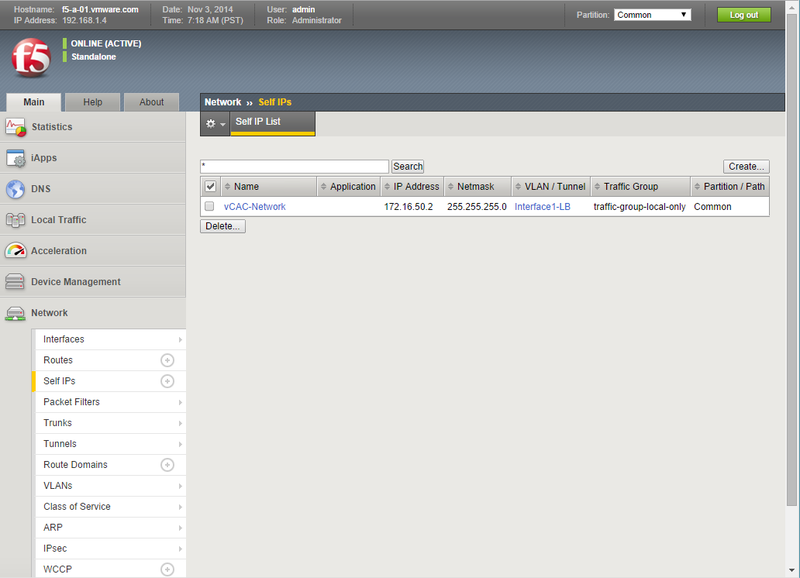 Navigate to the Network tab and then to Self IP’s tab. 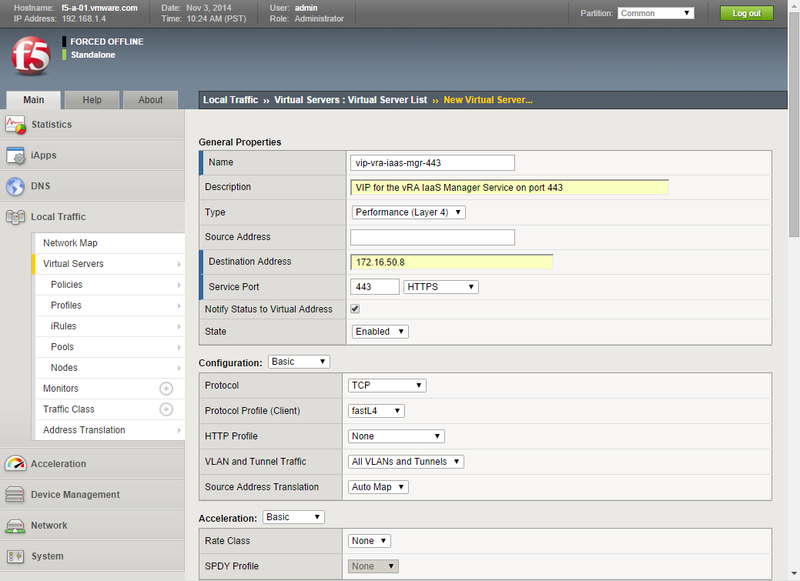 On the New Self IP (SIP) page enter the Name , IP Address and Netmask. 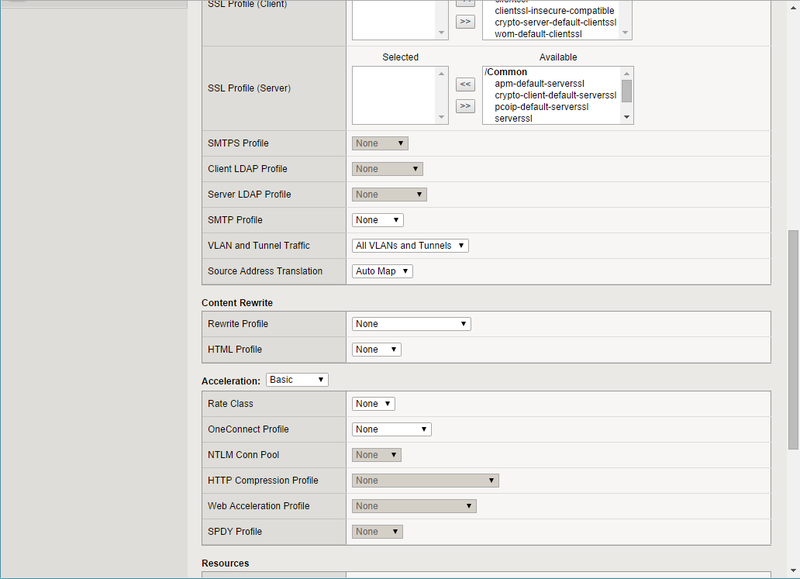 The SIP address acts like an interface through which the F5 can communicate on a given subnet. 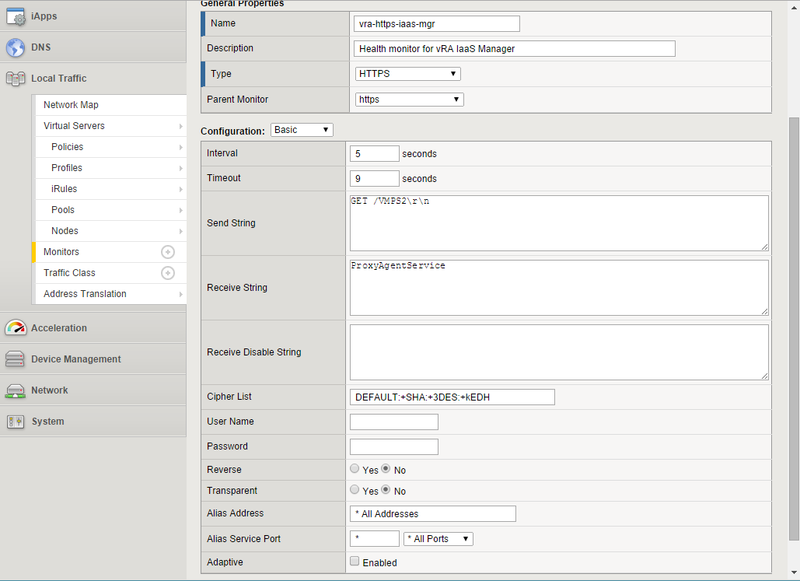 In this example we will connect this to the subnet where the vRA will be deployed. 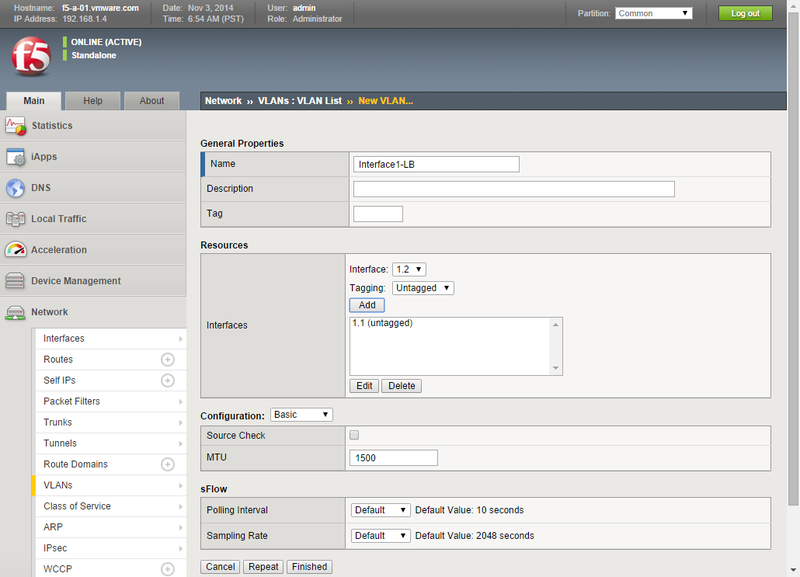 In the VLAN/Tunner option select the Interface1-LB we configured earlier. 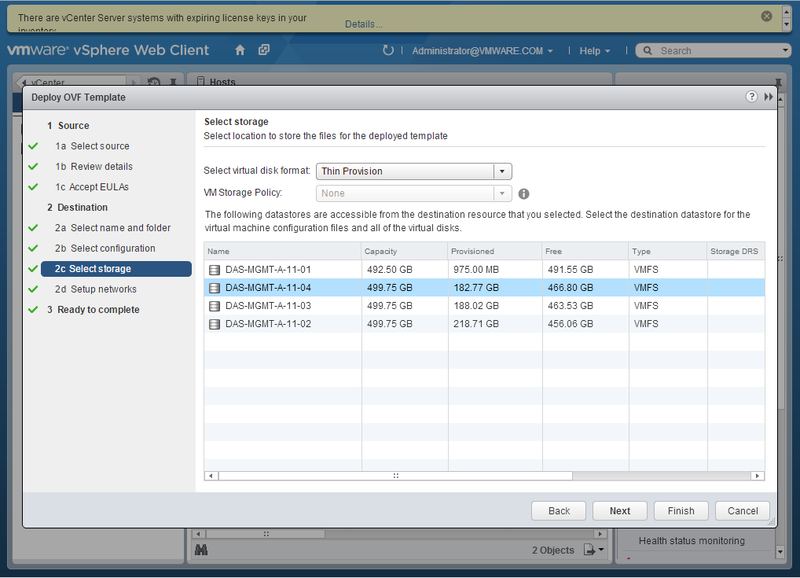 In the Port Lockdown option select Allow All. Navigate to Local Traffic and then to Monitors. Here is where we will create our health monitors to monitor our pool members. You should see the Health Monitor being created. If you have set the vra-https-postgres monitor for the pool-vra-va-5432 and you have already configured vRA Internal Postgress replication you will see the active node shown with status Available (green) and the passive node with status Offline (red). This is the case shown on the screenshot. Node: The pool will be shown with status Offline. 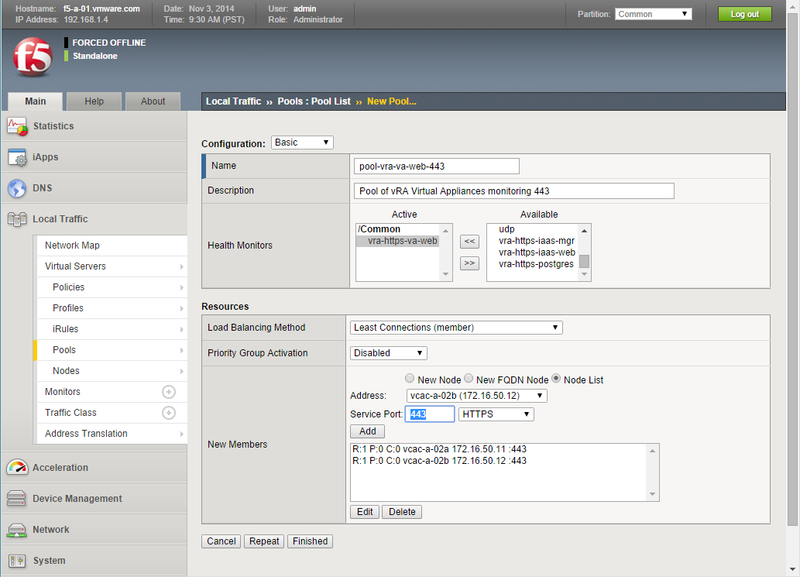 During the initial deployment of the vRA nodes you might need to switch the pool Health Monitor to https_443 in order to see if the nodes are reporting. 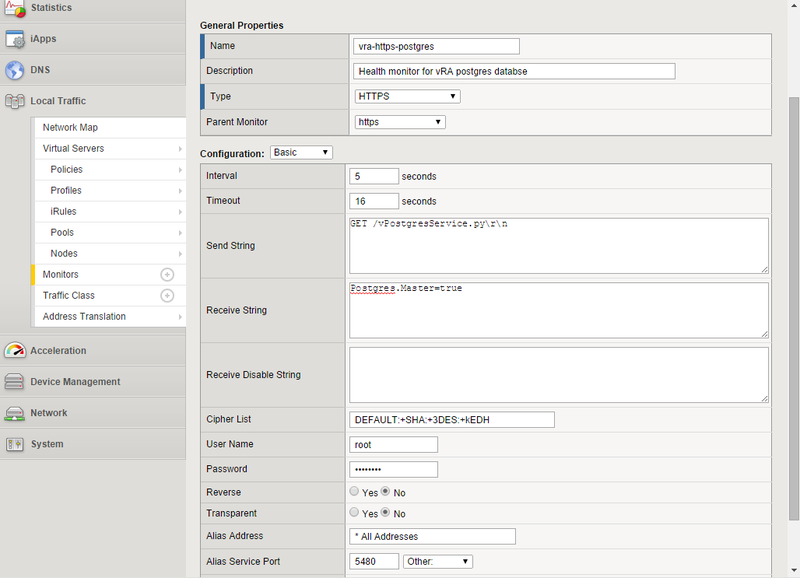 You should switch back to the vra-https-va-web after you have configured IaaS components as the monitor is looking for services to be registered. Note: The pool will be shown with status Offline. 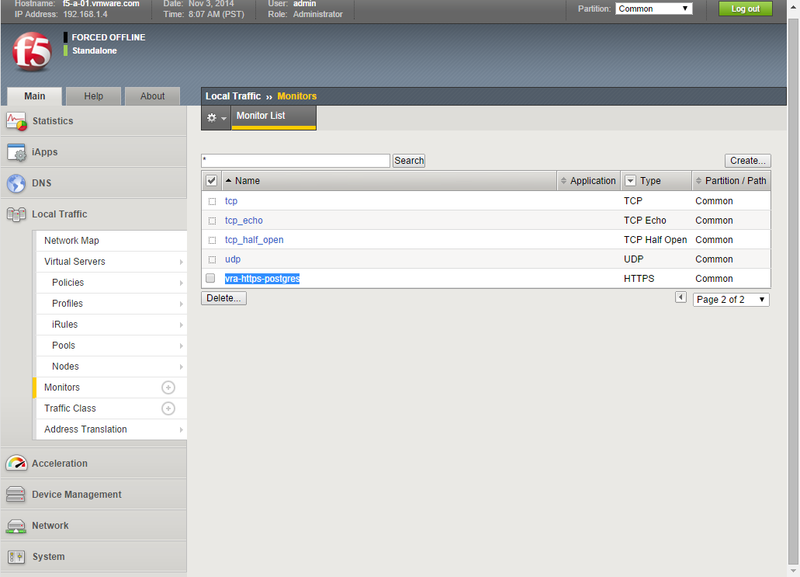 During the deployment of the vRA Iaas Web and Model manager Data Servers you might need to switch the pool Health Monitor to https_443 in order to see proceed with the deployment. 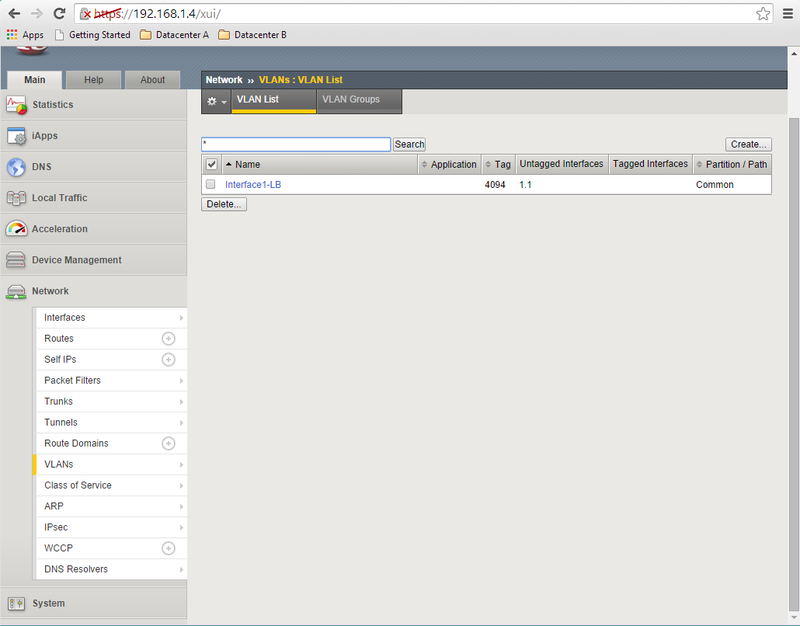 You should switch back to the vra-https-iaas-web after you have deployed the servers. Otherwise you deployment might fail. 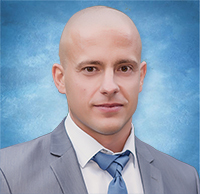 Node: The pool will be shown with status Offline. 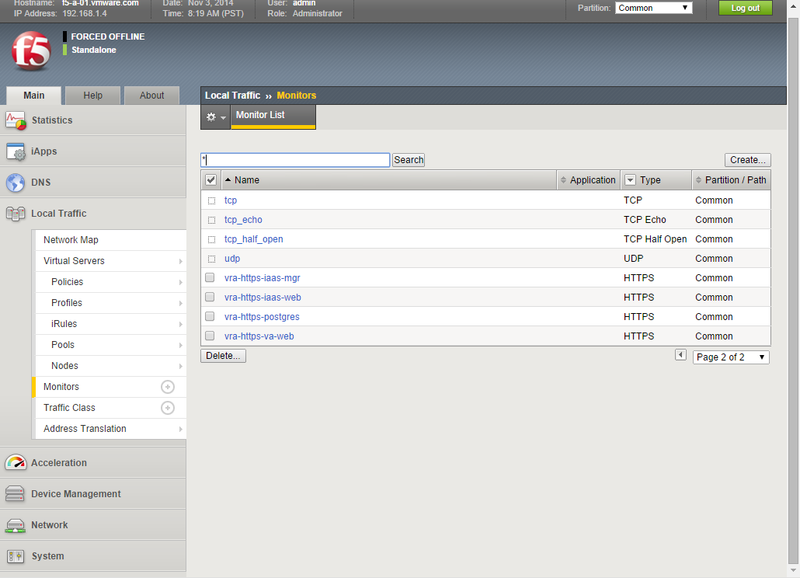 During the deployment of the vRA Iaas manager Servers you need switch the pool Health Monitor to https_443 in order to see proceed with the deployment. 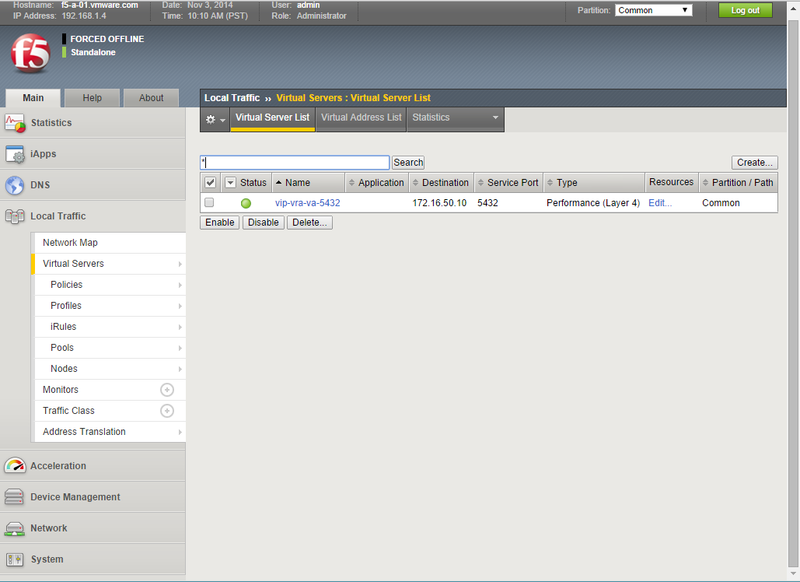 You should switch back to the vra-https-iaas-mgr after you have deployed the servers. Otherwise you deployment might fail. At this point you should see all 4 pools being configured. Note: Iif the pools are not configured with default https_443 Health Monitors, and the actual vRA components are not installed, most of the pools will have status Offline (red). 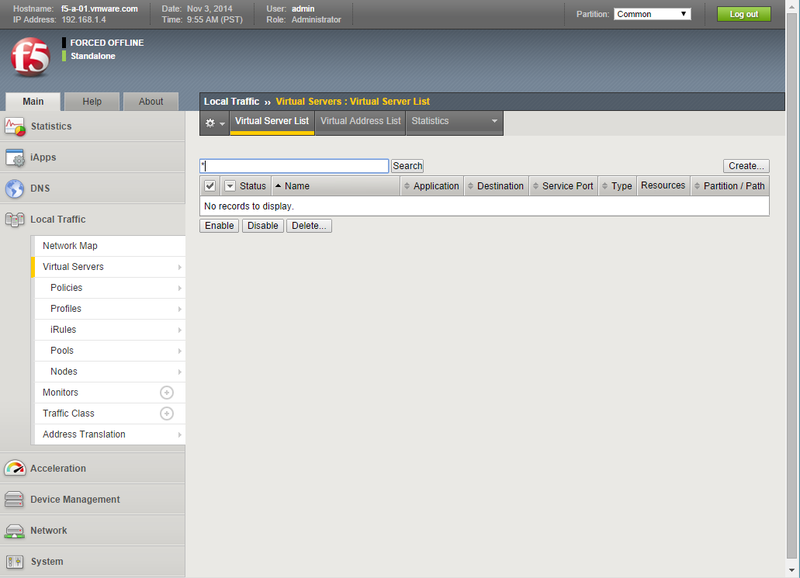 Navigate to Local Traffic and then to Virtual Servers. You should see the pool being created. You should now see the following pools created. Note You might see most of the pools shown as Offline (red) due to the reasons mentioned earlier. 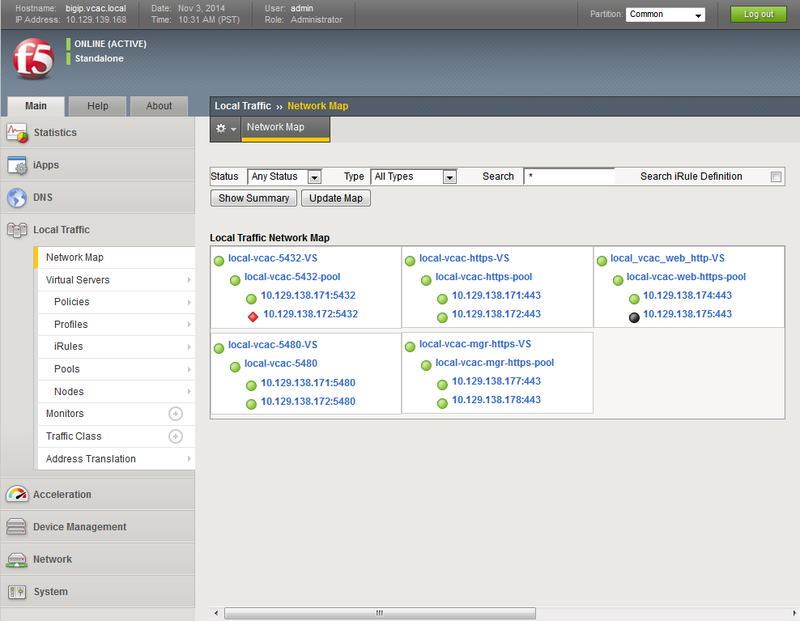 Navigate to Local Traffic and then to Network Map. 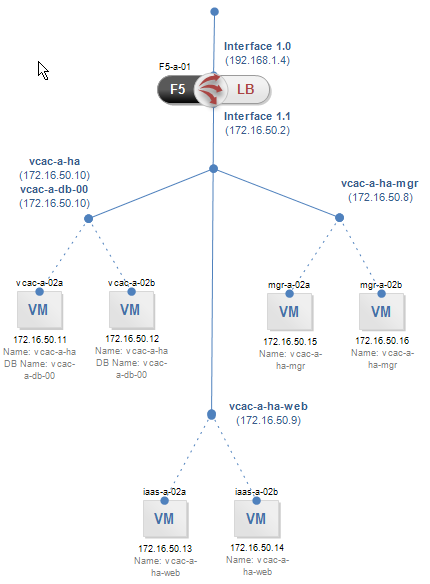 As mentioned earlier depending on the health Monitors configured and the stage of the vRA Distributed install, you might see most of the servers shown with status Offline (red). This is shown on the first screenshot. This entry was posted in BIG-IP, F5, LB & HA, LB & HA, vCAC, VMware, vRA and tagged SKKB1006. Bookmark the permalink.